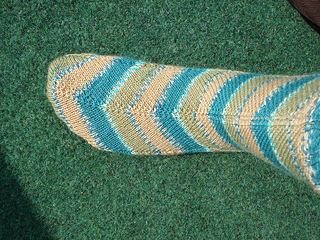 Grumperina’s Jaywalker socks are widely loved for the way they showcase multicolored sock yarns and the great fit of the bias knitting in the chevron pattern. 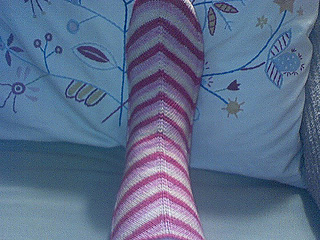 I wanted these great features in a sock that I started knitting one weekend when I was on a little vacation from the daily grind, and I was away from my stash of knitting patterns and without internet access. 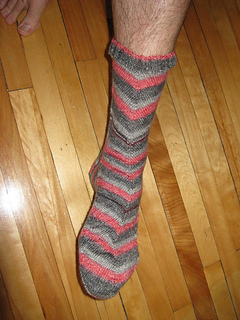 I had no way of remembering or recreating the math and the numbers of the stitch pattern in the Jaywalker socks, so I used their chevron pattern as inspiration for socks that would be bias knit and show stripes well, but don’t require counting out a stitch pattern. 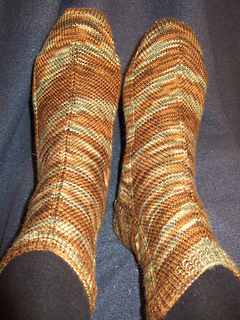 Jaywalker socks are lovely, but their knitting pattern is a little like the traffic strategy they are named for: requiring concentrating, focus, and timing. I propose that there are times in life (such as a weekend vacation in a small town) when you have enough time and patience to just wait at the light and take the crosswalk. It’s the timid, boring way of getting there, but the crosswalk puts less strain on the psyche, and less wear and tear on the body. Either way you end up across the street! I present the Crosswalker Socks! For the times you’d rather take the easy route around your obstacles. For when you’re so relaxed, or in need of knitting so relaxing that you can’t be bothered to really count stitches. 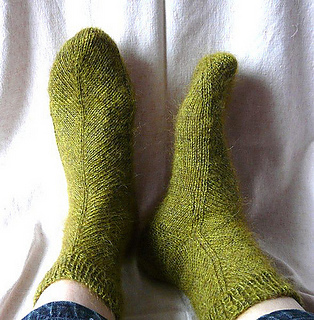 It’s a sock pattern that’s fully adjustable to your yarn, gauge, and foot size, and it’s fully accommodating of your desire to knit attractive, well-fitting socks, no matter what the state of your courage and ability to concentrate!